Uber is about to lose its exclusivity in Google Maps, as Google will begin to show other "taxi" services and make it easier than ever to choose the cheapest one. Google Maps has long given us the option to see how we can reach a destination by car, by bike, on foot, or using public transportation. Late last year Google added Uber to the mix, and now it's about to do the same for similar taxi services and ride-sharing apps, like mytaxi - though you'll still need to have each app installed in your smartphone. Even if you plan on just using Uber, the update will allow you to quickly compare fares using different Uber services if available (like uberX, uberXL, uber Black - or, as we currently have here in Portugal, uber Green with 100% electric vehicles. :) Should you be in a place with other services available, and have the app installed, you'll get even more options and prices to choose from. 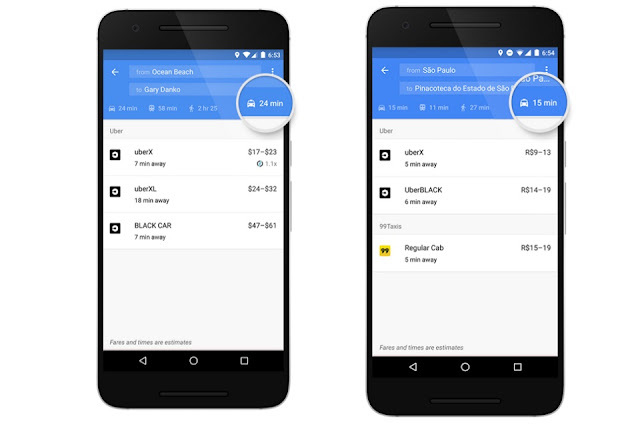 Besides Uber, Google says users will be able to get this added info from: 99Taxis in Brazil, Ola Cabs in India, Hailo in the UK and Spain, mytaxi in Germany and Spain, and Gett in the UK. In the (not so) distant future, one can imagine using this same feature to automatically request a Google driverless car to take us to our destination.